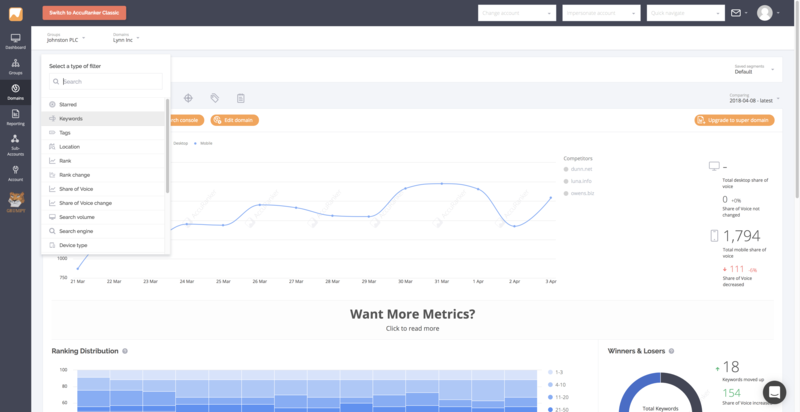 AccuRanker is a search engine marketing and SEO tool that allows you to import the keywords indexed by search engines into an intuitive and powerful web-based solution. AccuRanker's suite of features is constantly evolving. We aim to drive growth through insight. A cloud-based SaaS technology with a groundbreaking user interface. Featuring automatic data refreshes every 24 hours or on demand. No installation of local software is needed, data is accessible from anywhere in the world. Monitoring competitors with the Share of Voice feature. Competition monitoring in AccuRanker is simple and you can track your competitors at various data points across your account. Landing page monitoring. With AccuRanker's preferred URL feature, marketers can monitor which landing page search engines have indexed for any given keyword. Landing Page - directing users to the right landing page is crucial for user experience. With the Landing Page Section you can see combined data on keywords relating to your specific pages and see which keywords are driving traffic and where. Tag Cloud - The Tag Cloud Section you can see combined data for all keywords group under a specific tag. See a wide range of advanced metrics on the tags that you use to organise and structure your account. Filtering and Segmentation features. With AccuRanker you have the option to apply an extensive list of filters to the data contained in your keyword related sections. This enables you to streamline your view and access targeted metrics for the keywords that you want to work with. The option of importing historical keyword data, directly from other SEO tools or from a CSV-file. Accuracy. AccuRanker is renowned for being the most accurate SEO tool on the market. Local rankings with perfect accuracy and the ability to ignore local results, if needed, to avoid local SERP data from impacting non-local ranking data. The speed with which AccuRanker supplies fresh and accurate data allows users to check data instantly. Some use this feature to ensure the data used for clients or colleagues is the very latest. White Label Reporting options in AccuRanker are used by our agencies and single website admins alike, to send automated progress reports to themselves, their boss or clients. Using AccuRanker Notes to keep track of the steps taken in the optimization process to see the effects play out in real time. The ability to add multiple users to AccuRanker without any hassle. Marketing and SEO work is rarely a one man job. Business administrators need to be able to bring in the team. Are you ready to grow your business with accurate metrics?